Pete’s Big TVs continued its long-running relationship with Bruce Springsteen & The E Street Band by providing video production/projection, equipment and crew for “The River” tour. Pete’s Big TVs is provided close to 400 tiles of its digiLED DLP05.9 LED product. There are 180 tiles creating the onstage back wall, and 192 tiles for two side screens at 96 tiles per wall. The side walls each create an upside “T” shape so that content can be played either horizontally or vertically. This configuration has become a standard format over the years, designed to offer the audience the best possible image magnification, but the LED equipment is new. The popular new indoor/outdoor DLP0.59 LED, recently added to its inventory, offers 6,000 nits of brightness, and the tiles’ light weight, each at 6.6 kg (14.5 lbs. ), making it lighter and easier to rig. The tiles are also installed without tools, making it faster to install. The tiles can curve - convex or concave - up to 15 degrees in any direction, giving it flexibility in the variety of venues on the tour. Award-winning Video Director Chris Hilson returned to the director’s chair at the video switcher, selecting the best camera shots to display on screen, while video crew on cameras included Paul Whitfield, Rob Villalobos, Tyler Chappell, Will Farnham, Erik Hartman and Roger Rubey. Pete’s Big TVs has enjoyed working with Springsteen since 1999. Said President Peter Daniel said, “It’s so comfortable to work with the management team of Jon Landau and Barbara Carr, production manager George Travis, and of course Bruce. 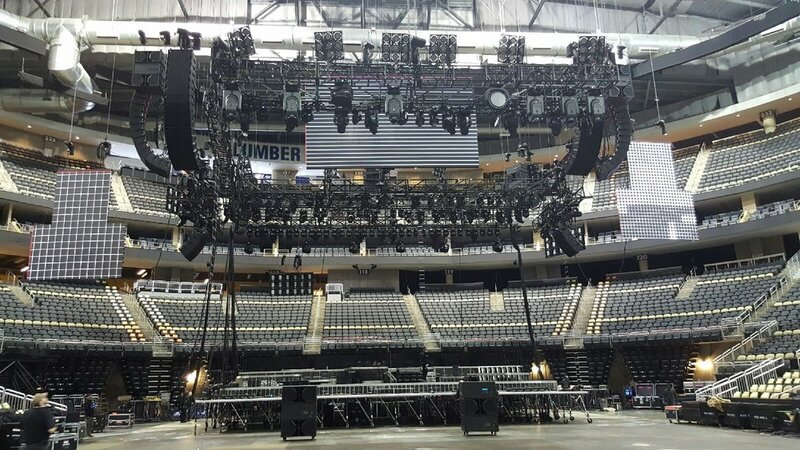 It’s a warm, inviting place to be.” Longtime lighting designer Jeff Ravitz continues his relationship with The Boss as well, with lighting vendor Morpheus Lights. Springsteen’s show covered a complete set from “The River” album, along with other favorite hits. Surprises also showed up on the set list, such as tributes to the recently depart David Bowie and Glen Frey.